Arizona Sycamore is a member of the Plane Tree Family. It is a large, deciduous tree which grows upwards of 80 feet in height with a trunk to 4 feet in diameter. 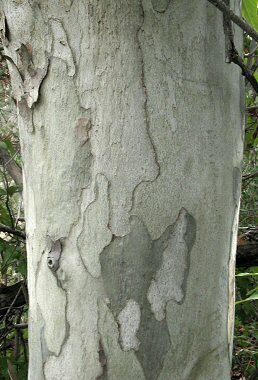 Bark is smooth, and whitish or pale gray in color and usually has peeling flakes. Leaves are light green and large (up to 10 inches long) with 3, 5 or 7 pointed lobes. 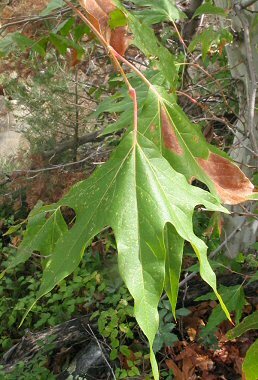 The AZ Sycamore typically grows in along streams and in rocky canyons at elevations between 2000 and 6000 feet. The roots of the Arizona Sycamore help control stream side erosion. The tree typically blooms between March and April and produces inconspicuous flowers which grow in dense clusters.